When I decided to venture to London to see the Stephen Sutcliffe exhibition I expected to view a film. Described by the blurb on the gallery’s website, I was to anticipate enticing “fragments of broadcast images and the written and spoken word”. Upon arriving at the Zilkha Auditorium (the room selected to stage Sutcliffe’s work) I was met by a notice giving the titles of nine video works. Fantastic – nine films when I expected one! Or so I thought. Adding to this unhinged gallimaufry of footage, and continuous film after film structure, was the uncomfortable setting of the exhibition. My initial thought when entering the room was “gosh, these chairs are distracting”. Multi-coloured chairs lined the room that was far too brightly lit for video showing. Not a good first impression. 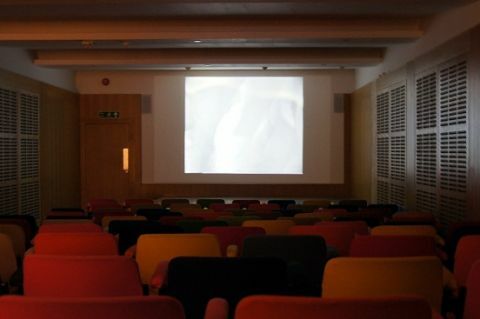 Moreover, the room acted as an inappropriate thoroughfare for members of staff wishing to get through the door next to the screen, and the sound from the neighbouring exhibition flooded into the auditorium. Initially this was exasperating but as the films became further disjointed I started to ignore the distractions, as they blended well with the head-ache inducing nature of the artwork. The incoherent structure of the videos appeared void of narrative, but I wished not to be defeated. I needed to delve more deeply into the seemingly nonsensical thinking of Sutcliffe: what were the films about? Were they connected? What were the artist’s intentions? This was proving to be a challenging exhibition. Occasionally a video would appear that drew upon lines of humour. One film clip, for example, showed the artist drawing a moustache over the face of Dirk Bogarde. But if laughter was what the artist was trying to provoke then the work as a whole seemed empty. Sutcliffe’s intentions must have been far deeper than simply wanting to make films for comedic effect or entertainment. After twenty-five minutes and the viewing of various short films I was far from entertained and certainly not laughing. During the screenings the only feelings that I sustained were those of annoyance and discontentment. A video of a man prodding books with a stick, merged with incessantly irritating ‘ping’, ‘ping’, ‘ping’ noises, only added to my aggravation. I’d had enough. Just when I was ready to arise from my seat to leave the gallery in a fit of frustration, the title ‘Despair’ appeared on the screen. Despair…the exact word to describe my feelings. How did Sutcliffe know I was feeling despair? Like the annoying noises heard previously… PING… suddenly the light bulb in my head gleamed. This was the artist’s intention. Through his playful manipulation he had created a scenario where, through the use of themes such as disjointedness, confusion and unsettlement I had purposely been lulled into a nettled state. Sutcliffe’s work was intentionally beginning to provoke saplings of flustered emotion. The fact that the title ‘Despair’ was so influential in evolving this interpretation pushed me into wanting to learn more. From the exhibition information outside of the entrance I discovered that ‘one reason for making [the] version of ‘Despair’ was [Sutcliffe’s] inability to track down a copy of Fassbinder’s version’ of the novel by Vladimir Nabokov that goes by the same name. Here we find a motive. Nabokov (a Russian writer) notably unfolded methods of repetition, reduplication and echoing in his work and it became clear that Sutcliffe wanted to play on the themes of Nabokov to create his own adaption of ‘Despair’. It was now that I realised that Sutcliffe’s work was about the methodology of making – cutting, duplicating and layering until all narrative is deliberately confused. These techniques of appropriation developed ‘complex and disjointed relationships’ which begin with that of the connection between interpretation and fact. The way that we interpret the piece – thinking that it is simply a mash of random footage – is misleading and plays on the idea that there can be a vast gap between what we see and what we believe. This was worthy of more than a single layered interpretation. Another fold of meaning to be extracted is confusion over ownership. Sutcliffe addresses whether footage can ever be owned in its final form. The way that he overlapped video clips to give them completely new life and meaning made me imagine an original chunk of footage as a seed, which will only grow into its new form of a plant after being watered by an artist. He pulls on ideas of potential and how film footage is never to be discarded, but instead to be moulded into something exciting and new. This brings me full circle to the question triggered previously: does the viewer need to understand the context surrounding what they are watching to be able to appreciate it? In this instance: yes. Without delving into background information behind the artist and his intentions I would have not been a happy viewer. The exhibition was heavy going and certainly not for those who wished to be entertained. However, upon reflection, this exhibition may be worth a re-visit. It’s the type of work made for a thinker – and for someone who will appreciate complex methods of creating meaning. I would not praise it, however, for its visual appeal or accessibility to a passive viewer. Currently studying Fine Art at Nottingham Trent University.